NextDo not forsake us Emperor Jovian: The shameful peace of the year 363 AD. 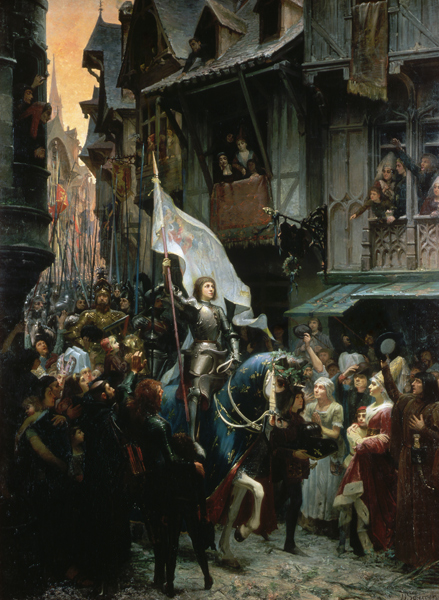 Joan of Arc, wearing a breastplate and brandishing her banner, rode at the head of the uncrowned Charles VII’s army and into history. She led the French to a famous victory by routing the English at the Siege of Orleans in 1429. As the people of Orleans burst into rousing cheers, questions were immediately asked who was this young woman? 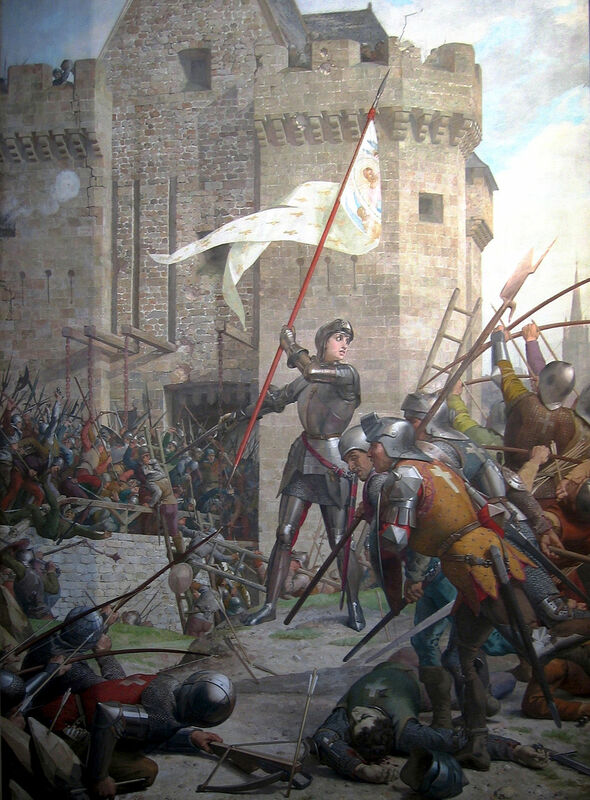 For seven months Orleans had been under siege by the English and now in a little over 4 days of fighting, Joan of Arc, a simple peasant girl, had liberated the town and its inhabitants. It was truly a miracle. Their liberator had swapped a life of spinning wool besides her mother to don a suit of armour, answering a call from God at only seventeen years of age. France’s national heroine, nicknamed ‘The maid of Orleans’ years earlier at the age of 13 had a vision of Saints Michael, Catherine and Margaret, who called upon her to save France from the English and bring Charles (the Dauphin) to Reims to be crowned King. It wasn’t until she was sixteen that she no longer doubted the voices in her head as they gradually revealed to Joan her mission in life. With nothing more than bare essentials and a handful of loyal supporters, she set off on her life changing quest. She was very tenacious and made several attempts to seek an audience with Charles in 1428, but was refused each time by Robert Baudricourt, the garrison commander at Vaucouleurs and a supporter of Charles VII. Irritated by Joan’s requests to see Charles, Baudricourt quipped at Joan’s cousin, who had accompanied her, to take her back home to her father and give her a good whipping. However, early in January, 1429, she again visited with Baudricourt, where her persistence gradually wore him down and her wish was granted to see Charles. She cropped her hair and dressed in men’s clothing she made her way through war torn territory held by the English, before finally arriving at Charles court in Chinon. It was then in the presence Charles that she told him of her vision. She apparently never divulged what she actually said to him. We can only imagine what the details of the conversation were about. Did she speak to him with respect or did she chastise him for being weak for allowing the British to oppress the people of northern France? We generally don’t believe she would have chastised him, but whatever she did say to him, he was utterly convinced that only a messenger of God could know of such detail about him. He now believed that it was possible that he would be king. Did a prophecy around the time of Joan add weight to her sudden rise? It may have as it claimed that a young maiden would come forth from an oak wood to liberate France. Many people believed that France, ruined by Charles’ mother for siding with England in the Treaty of Troyes, and all but disinherited her son, giving the English control of northern France, was now going to be rescued by the honorable virtues of a young virgin. It was against the advice of his counsel and generals, that Charles was ready to give Joan an army and his blessing. However, before the ravings of a peasant girl were to be taken seriously, she was examined by ladies of the court to prove her virtue as a virgin and by theologians at Poitiers to verify her orthodoxy. What became obvious pretty quickly was that supporting Joan’s claims would inevitable turn a new offensive against the English into a religious war. In the medieval world, war was inevitable fought along the grounds of whose side was God on. In the early fifteenth century, the English believed God was on their side and evidence of this claim arguably manifested in their great victory of Agincourt in 1415. But the French did not believe their claim. The explanation that they came up with was that the French were being punished for their sins. They were deep in civil war at the time with the Burgundians and Armagnacs fighting for the control of the French government. The Burgundians would eventually side with the British, believing that God was with them. But the supporters of Charles (the Dauphin) and Joan of Arc disagreed wholeheartedly believing that God did not abandon them. Curiously Joan’s appearance at Charles court and with the visions that she declared came from God to Charles could only suggest that God was on their side. Though Joan troubled the theologians at first, in the end they could not find any reason to not believe her claims. She appeared to be genuine and pious. The theologians concluded that Charles should not stop her because to reject a true prophet would be a sin in itself. To allow her to prove herself at Orleans would prove that God was truly on their side and once more the Armagnacs, led by Charles would be proved to be the rightful heirs to the French throne. As Charles moved forward with preparations for the assault on the English at Orleans, he charged his best blacksmith to make Joan a suit of armour to fit her slight frame. He also provided her with a sword. In preference to the sword Charles offered Joan, she insisted that another sword, a holy sword, tucked behind the altar in the chapel of St. Catherine of Fierbois be found for her. A holy sword for a Christian warrior seemed the order of the day. The voices in her head had instructed her where to find it and when it was found and brought to her, it was believed to be more proof that her visions were true. Finally, she was presented with a white silk banner, of Christ accompanied by angels, to encourage the troops that God was on their side. It was in late April in 1429 that Joan aided by Charles experienced commanders were ready to set off to liberate the besieged city of Orleans. Joan famously started preceedings by sending the English a letter ordering them, to “Begone, or I will make you go.” But the English were undeterred by this young upstart calling her everything they could lay their tongue to. With the English unmoved Joan was intent on fighting the French from the moment she lay eyes on Orleans. But the Armagnac commanders thought it best that they first bring Joan into the city and wait for the remaining reinforcements. Joan was undoubtedly left kicking her heels and for at least a few days, paraded around the streets distributing food and goodwill. She even climbed the walls of the city, yelling at the English to leave before it was too late. Her cries were in vain as they hurled abuse at her from across the rampart calling her an Armagnac whore. They were particularly disgusted by her appearance dressed in men’s clothing. It was on May 4th, once her soldiers had all arrived into the city, that the assault on the English began. Contrary to popular belief that she wielded a lance or sword, she did not have the heart to kill any man and instead accompanied her new army carrying her ‘holy’ banner to rallying them. Even though she loved her sword, which was found in the church of St. Catherine, she loved her holy banner “forty times” better than her sword. It was enough to inspire the people of Orleans and Charles’ army. Although she never actually fought in the battle herself, it was at Orleans that she witnessed first hand bloody war and death. Yet she was still close enough to the battle, that she suffered a wound between the neck and the shoulder, by a stray enemy arrow in a trench. She had her soldiers to attend to her wound and it was said she later returned which inspired the French. This happened on the last day of the assault (7th May), and with the sight of Joan leading her army once again, the English were finally rattled. When the English commander Glasdale slipped and fell into river Loire and drowned during the assault on the Tourelles, the English soldiers panicked falling further into disarray. The English subsequently lost the south bank of the Loire and were completely routed, suffering heavy losses. On the morning of May 8th, the English retreated from Orleans unmolested by the French. With the siege lifted, a secession of victories followed shortly after led by Joan and culminated in the victory at the Battle of Patay. The French had driven northward into English territory along the Loire Valley opening a passage that Joan felt was safe enough for Charles to now ride all the way to Reims to be crowned King of France. 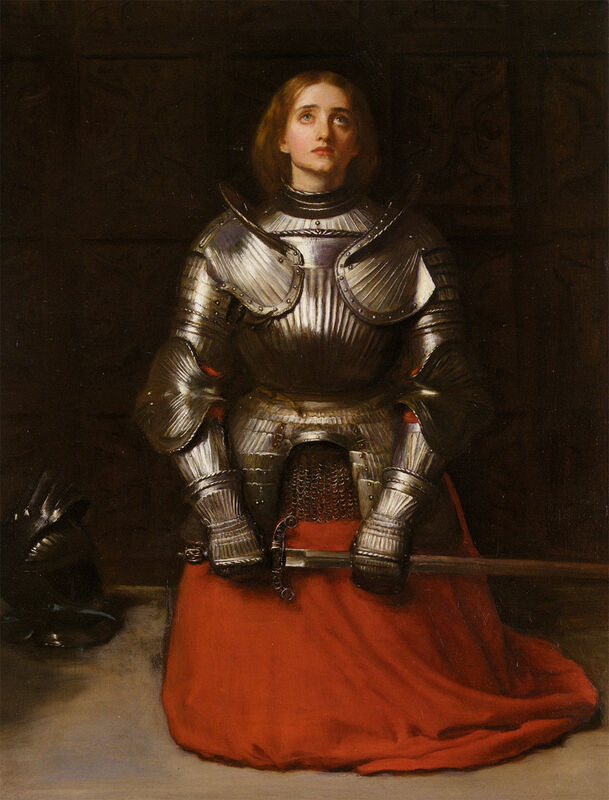 The power of faith had driven Joan of Arc to act in an extraordinary manner. She had won the day for France and as foreseen, Charles with Joan visibly in attendance by his side was crowned king at Reims on 17th July 1429. After the coronation Joan knelt before her newly crowned king, calling Charles her sovereign for the first time. Joan, it seemed had accomplished what her visions had first foreseen all those years ago back home in Domremy. Hailed a hero by the French, despite being accused as a heretic and witch by the English, Joan had accomplished a great deal, but still she felt that her mission in life was somewhat incomplete. God had commanded Joan to save France from the English, yet the English were still in much of northern France, despite their defeat at the hands of Joan. It was time Joan thought, to drive the English out of France forever. Definitely one of the most fascinating figure in history. And also just the various portrayals of Joan of Arc in film would warrant a whole essay in itself. George Bernard Shaw’s film version from the twenties is pretty wonderful, though Mila Jovovic’s take is pretty special too. And actually there was a TV serialisation of the Joan of Arc story that featured Peter O’Toole among others and that was pretty good too. Have you ever read any of the contemporary transcripts from Joan’s trial? They’re quite interesting; just the fact that they’ve even been preserved is interesting in itself. There is a wonderful wealth of information about Joan in the transcripts from Joan’s trial. I have read and skimmed through much of it. If it was not for those details, I dare say we would not know much about her? Interestingly, a sketch exists within the pages of the Parliament of Paris. The first image ever of Joan! There is a wonderful book by historian Helen Castor that does absolute justice to Joan’s story that I read a few months back. Set against a religious background France was desperate for a sign from God that they weren’t abandoned. Part 2 of my Joan of Arc (revisit) will briefly focus on her demise. Abandoned by her king, captured by the Burgundians and put on trial by the English. It’s no wonder she has been a focus of attention in particular in our last century. By the way I have never seen Mila Jovovic’s portrayal of Joan. An essay on the various portrayals on film would be interesting. The wealth of art on her is amazing too. I look forward to reading the second part of your post. Yeah, Mila Jovovic’s portrayal is very interesting; she goes much more for the mentally disturbed, slightly unhinged take on Joan. It’s actually quite poignant in places, though the film overall is a bit off-the-mark. 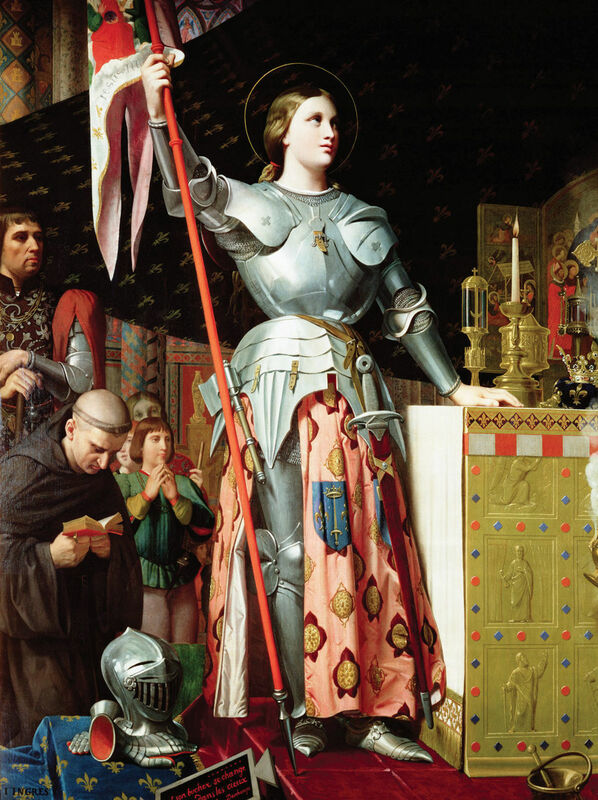 It’s always a pleasure to read Robert Horvat’s take on history, and this time he takes us back to the 15th century with the first part of a profile on French hero Joan of Arc. I don’t know nearly as much about Joan as I should, though obviously she’s a fascinating figure and one without equal in the Middle Ages. Great job, Robert, and I look forward to the next installment!